Saturday night, the Cavaliers were on the brink. They trailed 2-1 in the Eastern Conference semifinals and faced an important game on the road in Chicago. Fortunately, the Cavs also have the best player in the world — someone who has led his teams to four consecutive NBA Finals appearances. LeBron James went to work. Four days later, Cleveland is back in control of the series, and suddenly a fifth straight Finals trip for a LeBron-led team looks plausible once again. James sank one of the biggest shots of his life on Sunday afternoon in Game 4. As time expired, James drained a fadeaway in the corner to win the game and tie up the series. That play, notably of his own design, just might prove to be the biggest inflection point of the Eastern Conference playoffs. It was exactly the kind of shot we expect the best player in the world to make. But he wasn’t done. On Tuesday, James played magnificently, getting to the rim at will and converting more than half of his shots for the first time in the series. Heading into Game 5, James was having a terrible-by-his-standards series. Maybe it was Jimmy Butler’s lockdown defense, or maybe it was something else, but he was a turnover machine with a crooked jumper. James has been the defining NBA player of the post–Michael Jordan era. He has been so good for so long that it’s hard to contemplate his basketball mortality. How do you really critique a player who does everything so well? What do you say about a player still capable of putting up 38-12-6 lines against the Bulls? But Father Time remains undefeated, and even though James still dazzles, his hardwood radiance isn’t quite as brilliant as it used to be, particularly as a scorer. The first four games of the Bulls series provide a perfect illustration of the subtle signs of decay that are starting to creep into James’s scoring numbers. In Game 1 he went 9-of-22, in Game 2 he went 13-of-29, in Game 3 he went 8-of-25, and on Sunday he went 10-of-30. For a guy who built an empire by making lots of baskets at unusually high rates, failing to convert half of his shots through four games of this series is noteworthy. But these uncharacteristic efficiency numbers extend beyond just the Eastern Conference semifinals; they underscore a bigger recent shift in his ability to get buckets. He is an average jump-shooter, and he’s increasingly reliant on said jumpers. During the postseason, James has outscored everyone except Blake Griffin within 8 feet of the basket. But James is converting just 35 percent of his midrange shots and a cringe-worthy 16 percent of his 3s. 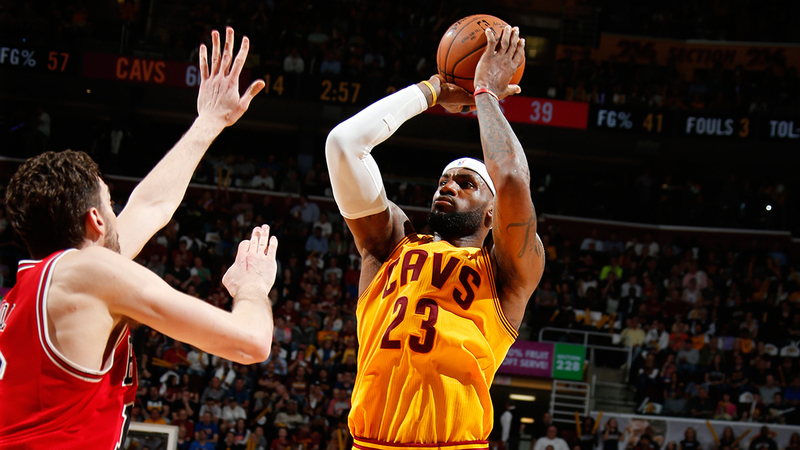 Out of 48 players who have tried at least 25 3s during the playoffs, James ranks last in accuracy. Although those splits may be unusually drastic, these inside-outside issues are nothing new. This is the key thing to watch as James enters the inevitable back nine of his career. At the exact time when his jump shot should be becoming more reliable, the opposite is happening. LeBron James has such a compelling story: Ohio’s Mr. Basketball; the most fawned over high school basketball player of the modern era; a Star Wars–Empire–Jedi-like arc from Cleveland to Miami and back to Cleveland. He’s a rich text, to say the least. There’s another LeBron James story, though. It’s written in field goal percentage. This is by no means a perfect metric, but it tells a clean tale. For those of us who have watched James’s shooting percentages rise consistently throughout his career, the 2014-15 regular season provided some alarming data points. 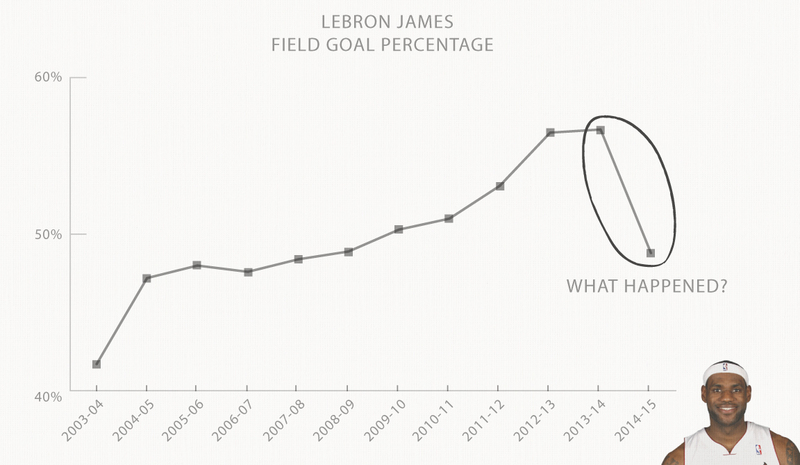 Through the first decade of his career, James’s field goal percentage was dependably ascendant. In his rookie season of 2003-04, he made just 42 percent of his shots. His second season, that number rose to 47 percent. Incredibly, it rose every year except one through last season, when James peaked and converted a blistering 57 percent of his shots. In the last 20 years, aside from James, there have been only two players to score at least 25 points per game while also converting at least 55 percent of their shots: peak Amar’e Stoudemire and peak Shaquille O’Neal. James accomplished that feat in each of his previous two seasons, but this year his field goal percentage dropped all the way down to 49 percent, his lowest number since the 2007-08 season, way before he won an NBA title. That’s a drastic dip. One of the core tenets of basketball analytics is that increased usage generally leads to decreased efficiency, and James’s numbers all point to something we can call the King’s Burden. This year, James shot more per 36 minutes and had a higher usage rate than he did during any season in Miami. Say what you want about Kyrie Irving and Kevin Love, but those numbers indicate that James has been more of a centerpiece in Cleveland this season than he ever was with the Heat, and now that Love is on the shelf, that’s even more true. It’s almost fitting. LeBron came back to Ohio and turned into a factory. Still, the numbers we are seeing (particularly 16 percent from 3-point range) can’t solely be explained by that King’s Burden. 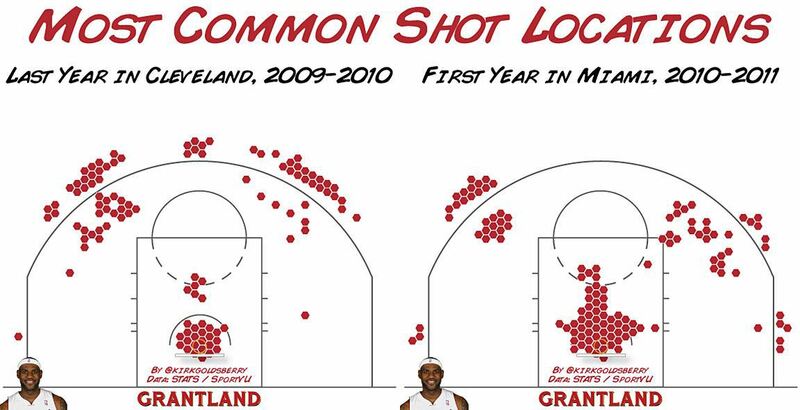 The league makes about 45 percent of its shots. At 57 percent, James was extraordinarily effective; at 49 percent, he is not. What’s different? Well, everything is. Ever since James floored us all last July, his entire basketball reality has been completely different — and there are two specific trends that seem to indicate his best scoring days are gone. If you’re looking for a few stats to summarize James as a dominant scorer, look no further than his out-of-this-world interior dominance during the previous two seasons. In his last two campaigns with Miami, James was able to combine volume and efficiency in the paint better than anybody — and it wasn’t close. During the championship run of 2012-13, he somehow managed to lead the NBA in both points scored and field goal percentage inside of 8 feet. Read that sentence again. That’s not fair, and anyone who ever repeats this feat should consider themselves the most dominant offensive player in the league. Don’t hold your breath, though. Since the NBA started charting shot locations in 1996, only two players have done it:3 James in 2012-13 and O’Neal in 2000-01. Amazingly, James almost duplicated the feat last season, but an upstart Griffin narrowly edged him out in total close-range production. Still, even Griffin couldn’t come close to matching James’s cartoonish 75 percent efficiency near the basket. During the 2013-14 season, 99 players attempted at least 300 shots inside of 8 feet, and only one converted more than 70 percent of those shots. James made 75 percent. Say all you want about the rising importance of the 3-point shot, but the most important real estate on an NBA court remains the precious swath around the hoop. At his peak, James owned that land. Or maybe he was just renting. That monopoly on the painted area was bound to loosen at some point, and perhaps it’s unsurprising this was the year it happened. Combine a change of scenery with fatigue and age, and James’s interior numbers have finally slid from outrageous to just plain great. 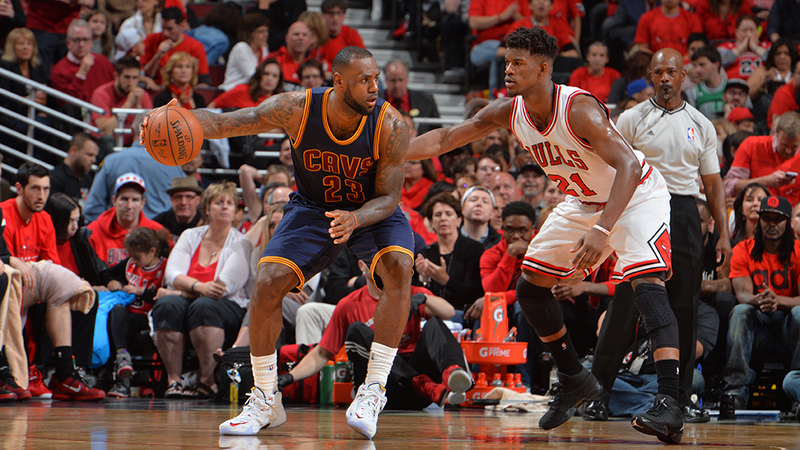 This season, James ranks sixth in efficiency from that close-range area and sixth in per-game production. By all measures, this is still a highly enviable — dare I say, elite — pairing of yield and effectiveness, but these decreases are meaningful harbingers nonetheless. Dudes in their thirties are less physically dominant than guys in their twenties. Last season, James took almost exactly half of his shots from within 8 feet and almost half of his shots from farther out. This season, the lion’s share of his attempts came away from the bucket. Sometimes field goal percentage better reflects where someone shoots than it does how well someone shoots (see DeAndre Jordan). Similarly, big year-to-year changes in an individual’s overall shooting efficiency generally have more to do with changes in shot selection than changes in form or ability. The best way for scorers to increase their field goal percentage is to lessen their dependence on jump shots and increase their close-range activity. But during his first year back in Cleveland, James has done the reverse, increasing his perimeter usage at the expense of his all-world interior play. For the last several years, James’s favorite midrange jumper has been along the left baseline, where NBA players knock down 40 percent of their shots. Last season, James was great at that spot, hitting 47 percent, but this year, in perhaps the most notable shift in his chart, James dropped all the way to 34 percent. Another ongoing shift in James’s shooting portfolio is happening beyond the arc. Like the rest of the NBA, he has fallen in love with 3s. This season he set a career high by taking 27 percent of his attempts from 3-point range; that figure was 13 percent during his first championship run three years ago. Yet despite his newfound enthusiasm for the long ball, James was an average 3-point shooter during the regular season, and he’s been terrible out there during the postseason. As his affinity for 3s grows and his presence near the basket shrinks, James becomes a little less terrifying. Just because there are some signs of wear and tear doesn’t mean we should panic. James is still a wonderful scorer. But anyone seeking to characterize his effect on the floor via his individual scoring numbers is doing it wrong. He has revitalized superstardom in the NBA in part by ushering in a new kind of team ball. He makes those around him better, and his impact never has and never will fit on a single row in a box score. In many ways, James remains the NBA’s ultimate rising tide; simply sharing the floor with him makes you a better basketball player. Just ask James Jones, J.R. Smith, Timofey Mozgov, or any other role player who suddenly becomes much more effective when he lands on a roster alongside James. One of the scariest individual offensive players on the planet is also one of its best playmakers. This observation crystallizes James’s greatness, but even playmaking deteriorates with time. If James has shown us anything in the last dozen seasons, it’s that he is willing and able to evolve as much as anyone, collecting four MVPs in the process. Given the vast amounts of turnover in his life, it’s no surprise there was some decline in his performance this season, and if this is what an off year looks like, a fifth MVP could easily await. As James slugs his way through yet another deep playoff run, he’s also giving us all an implicit seminar on the erosion of youthful greatness. It may say “Eastern Conference semifinals” on your cable guide, but the subtext is “great man seeking to overcome early-stage decay.” As James’s once-in-a-generation athleticism fades away, he’ll need to tweak things to keep his kingdom afloat. That may sound bleak, but there is no shortage of superstars who have changed their games to at least distract Father Time. Reinvention is a prerequisite of NBA greatness. It has also been James’s calling card. And if you’re looking to see what the future might hold, it might help to go back to the summer of 2011, when a frustrated James spent time in Houston learning from Hakeem Olajuwon. James showed up the next season with a terrific array of post moves, greatly reducing his 3-point habit. It may go down as the most important transformation of his career. He was able to find new ways to get good shots near the basket in half-court sets, and he helped put his team all the way over the top for the first time in his career. That Olajuwon skill set may come in very handy in the coming years. When it comes to getting good looks in the paint, James may not be able to bull past multiple defenders on dribble drives like he used to, but there’s no reason he can’t beat up opponents on the left block over and over again. Just ask Jimmy Butler. James may not be as dominant as he was a few years ago, but it’s clear that even when he’s operating at 90 percent, he still has the potential to be the best player on a championship team. One of the most interesting things about superstars is watching them change their games in the face of decreasing athleticism. It’s the most human thing about them. Michael Jordan and Kobe Bryant did it with fadeaways; Tim Duncan did it with defense and minutes reductions. What will Twilight LeBron look like? How many more magic hours does he have? Maybe we should just sit back and watch the sunset. The league average in this area hovers around 55 percent. This is extremely inefficient, with NBA players converting about 37 percent of their shots beyond 8 feet. With a minimum of 150 field goal attempts from within 8 feet. Broken at Bayern: What’s Next for Pep Guardiola?